We love Zanzibar because it’s more than a holiday: it is a (life changing) experience. What makes it special is the atmosphere on Zanzibar. It is unique and authentic, completely different from any other beach destination. Unguja Lodge is our home... This is why we can help you with any questions or wishes you may have! Unguja Lodge is situated at the Southern tip of Zanzibar, near Kizimkazi Mkunguni. It is a very quiet part of the island with pristine beaches and lush green surroundings. We love it and we protect it. Unguja Lodge offers a variety of activities to keep guests entertained, such as tours, a wide choice of beach sports and entertainment for all the family and kids. Unguja Lodge a small lodge with 10 private villas and two family houses. Have a look at our best photos of Unguja Lodge and the beautiful archipelago of Zanzibar. 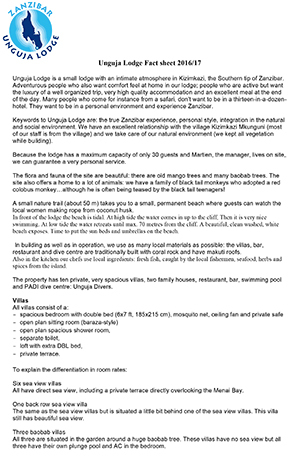 Contact us for our seasonal rates of accommodation, activities and tours at Unguja Lodge.